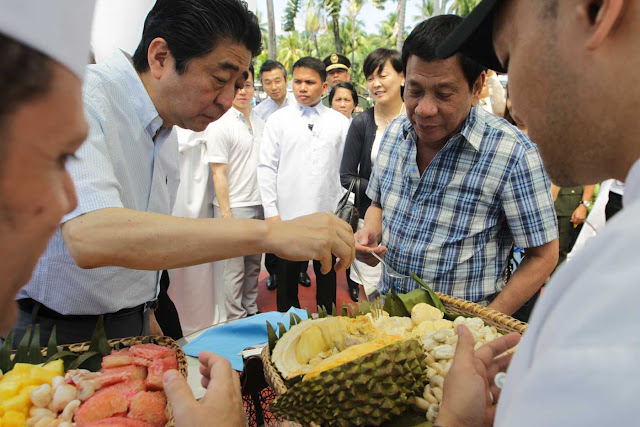 MANILA -- Regional peace and stability, as well as the North Korean nuclear program, would be among the top agenda expected to be discussed when President Rodrigo Duterte meets with Japanese Prime Minister Shinzo Abe in Tokyo next week, a Japanese official said Thursday. President Duterte is going on a working visit to Japan on Oct. 29-31 ahead of two key international summits in November – the APEC Summit in Vietnam and the ASEAN Summit where the Philippines is host. In a press briefing in Malacañang, Minister and Deputy Chief of Mission of the Japanese Embassy in Manila Takehiro Kano said the Philippine leader’s visit would further build upon the enhancement of the cooperation for the peace and stability of the region as strategic partners. “The two leaders would get together in Tokyo to discuss various issues related to the peace and stability of the region and international community, including the nuclear issues of the Democratic People’s Republic of Korea (DPRK),” Kano said. The Japanese embassy official said Duterte’s visit is timely as the two leaders would meet again during the ASEAN Summit where 21 world leaders, including China, Rusia and the United States, are expected to discuss the same issues. Kano said Japan has a strong position of supporting the Philippines’ chairmanship of ASEAN and appreciates President Duterte’s efforts in promoting regional stability. “We very much appreciate the leadership of the Philippines as a country and also as the ASEAN Chair has led the sending of a strong message in the form of the ASEAN Joint Statement, which deplores the recent activities, including the nuclear test or missile launch by DPRK,” he said. He said that other regional matters, such as the South China Sea issue, might also be tackled as this might be discussed later on in the ASEAN Related Leaders’ Summit meeting. Besides regional stability and security concerns, Duterte and Abe are also expected to talk about economic and infrastructure development. Kano said that several big-ticket projects under the administration’s Build-Build-Build Program, including the Manila Subway Project or North-South Commuter Lines, would be further discussed for realization. In the meantime, Duterte is also scheduled to meet other high-ranking Japanese government officials and influential captains of industry. “So Japan welcomes the President’s visit and we look forward to seeing that this visit will further enhance bilateral relationship,” Kano said. The Philippines and Japan have had extensive bilateral interactions since President Duterte assumed office in June 2016. Last January, Abe visited the Philippines and became the first foreign head of government to be hosted by President Duterte in Malacañang. The Japanese leader also went to Duterte’s home in Davao City. Abe’s return visit to the Philippines for the ASEAN Summit in November would likely see the signing of loan commitments for three big-ticket projects of the Duterte administration. These are the PHP230-billion Mega Manila Subway Project-Phase 1; the PHP211.5-billion Malolos-Clark Airport-Clark Rail Project; and the PHP9.99-billion Cavite Industrial Area Flood Management Project.